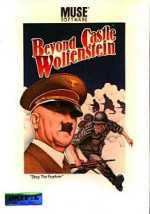 The sequel to Muse's revolutionary Castle Wolfenstein follows the same basic formula as the predecessor, while adding a host of new features that make gameplay more complex. The plot follows where the first game left off: the brass at allieds headquarters are so impressed with your heroics in Castle Wolfenstein that they send you on a mission to assassinate Hitler. You must locate some explosives and set them outside Hitler's council room, then escape with your life. The new features make it even more innovative than the predecessor. You can now collect security passes, which can be used to give to the guards to gain access to rooms. You can also bribe them with money if you don't have the pass, although at higher levels they are more difficult to bribe. You must also now be more careful when you kill the guards: if you leave any witnesses to the crime, they will ring the alarm, alerting tough, bullet-proofed Nazis to your location. Fortunately, you can now sneak into a room, and kill the guard from behind silently with a dagger. You can also find tool boxes and first-aid kits in supply closets, and you will be alarms to disable and guards to bribe. Unfortunately, you can no longer toss grenades and hold the SS guards at gunpoint, although all the new features more than make up for the inexplicable absence of these features. It improves upon Castle Wolfenstein in every respect. With the addition of alarms and dagger, you can no longer afford the "shoot everything in sight" tactic of the original. This makes BCW probably the world's first "thinking man's action game."